ICTP awarded its 2017 Dirac Medal and Prize to Charles H. Bennett (IBM T. J. Watson Research Center), David Deutsch (University of Oxford) and Peter W. Shor (Massachusetts Institute of Technology) for their pioneering work in applying the fundamental concepts of quantum mechanics to basic problems in computation and communication, thereby bringing together the fields of quantum mechanics, computer science and information, creating the field of quantum information science. The three medallists for 2017 each made key contributions in uncovering how the uniquely quantum characteristics of qubits may be exploited to process and transmit data, thus launching the field of quantum information science. For more information on the Prize winners, see: http://bit.ly/2Es3VzF. The 2017 Dirac Medal Award Ceremony takes place on Wednesday 14 March 2018 at 14.30 hrs with general talks by Peter Zoller and Artur Ekert followed by the Award Ceremony with talks by the three Prize Winners. This year's Dirac Medal Award Ceremony takes part at the opening of the Spring School on Superstring Theory and Related Topics. The Ceremony will be livestreamed from the ICTP website. The presentations are available at the links below. 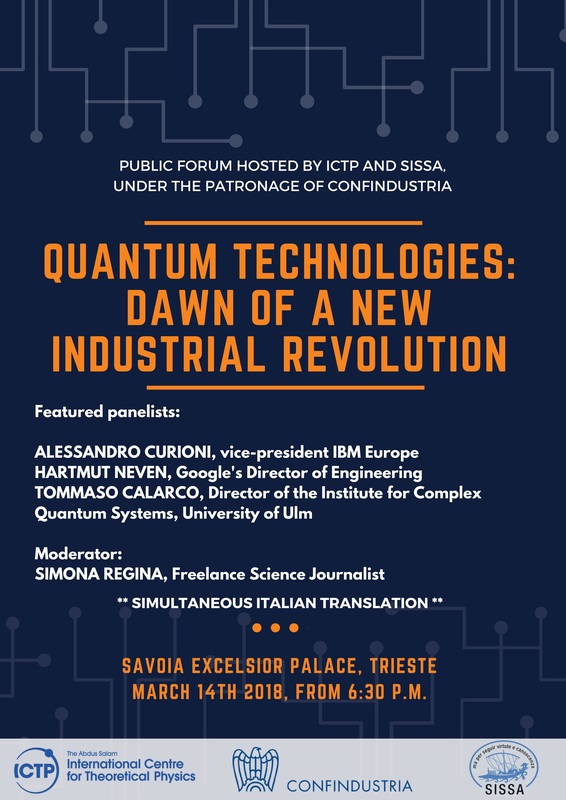 After the Ceremony, a public event "Quantum Technologies: Dawn of a new Industrial Revolution" is being organized at the Savoia Hotel in Trieste. The public event starts at 18.30 with featured panellists: Alessandro Curioni (IBM), Hartmut Neven (Google) and Tommaso Calarco (University of Ulm). See the poster at: http://indico.ictp.it/event/8519/material/0/0.jpg for more information. The panel will be moderated by freelance journalist Simona Regina. ICTP's Dirac Medal, first awarded in 1985, is given in honor of P.A.M. Dirac, one of the greatest physicists of the 20th century and a staunch friend of ICTP. It is awarded annually on Dirac's birthday, 8 August, to scientists who have made significant contributions to theoretical physics. The 2017 Awardees are Charles H. Bennett (IBM T. J. Watson Research Center), David Deutsch (University of Oxford) and Peter W. Shor (Massachusetts Institute of Technology). The ceremony, during which the three winners will present lectures on their work, takes place on Wednesday 14 March 2018, starting at 14.30 hrs.